Anzac Biscuits; Ride, Riccardo, Ride! The Anzac Stories: Behind the Pages exhibition has many fabulous Australian and New Zealand authors and illustrators in it. Go to Authors/Illustrators/Books to see the full list. This week we have the very talented Mark Wilson with his book 'Flapper VC'. 'Flapper VC' has just been released and is already selling well. Flapper was a big hit at the 2nd Annual Dromkeen Literature Festival last Saturday, and the kids love him (or more precisely, the hand puppet that pretended to be Flapper!). 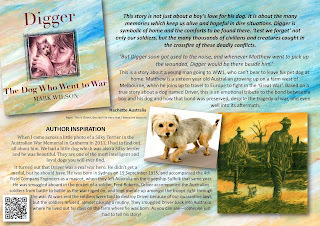 Based on the true story of Flapper, a messenger pigeon and his handler, an Australian soldier, during WW2. Raised and trained in Australia, Flapper survived four years of warfare in the Pacific, to eventually be pinned down and surrounded by Japanese troops during the battle for Manus Island in the late stages of the war. The patrol was almost out of ammunition, many were wounded, and the only radio they had was smashed by a stray bullet. The only hope of survival was to get a message through to Headquarters for support. It was up to the messenger pigeons with the patrol. The first two pigeons released were shot by enemy snipers, but Flapper, against all the odds, survived the snipers and machine gun bullets to get a message through that saved the patrol. Flapper was awarded the Pigeon version of the VC, called the Dickin Medal, for his actions on that day, and his medal is proudly displayed at the Australian War Memorial in Canberra, Australia. Published by Lothian/Hachette Children's Books Australia. This week we have the very talented Fifi Colston, writer, illustrator, craft maker, and entertainer as the feature author. 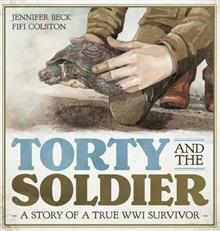 Fifi drew the illustrations for her latest book 'Torty and the Soldier', written by Jennifer Beck. New Zealand medic Stewart Little found Torty the tortoise in Salonika (now called Thessaloniki, in Greece) in WW1. Stewart was taking time out from his hospital ship duties when he saw the tortoise ambling along a dirt road. He watched in horror as a French gunner cart rode over the little tortoise. Stewart rushed to see if it was dead and found it looking rather squashed but still alive in the dirt. The tortoise needed some care and Stewart decided to look after it on board HS Marama ship. The tortoise amused the invalids on board while they sailed back and forth from Alexandria to France to England and back again, picking up more wounded soldiers. When the ship sailed home Stewart had to decide what to do; take it home and risk the wrath of his senior officers - no pets were allowed back into New Zealand - or drop it off at one of the stops. A heartwarming tale about the oldest living WW1 survivor. To illustrate this heartwarming tale Fifi visited the still alive tortoise in Napier and sketched it. She also took photographs of the replica Torty tortoise at Te Papa Museum in Wellington, New Zealand, where they have a lifesize exhibition on WW1. Fifi chose to use a limited palette, using sepia-colours; the olive green and browns of the army uniforms, a pale blue water-colour wash for the sky, and has aged the pictures with splatters and crease-marks, which give it an authentic antique-look. 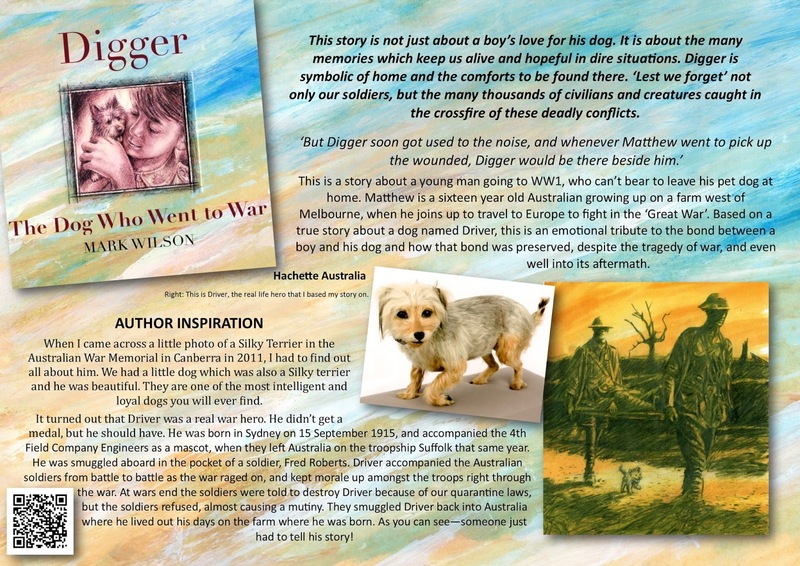 It's a stunning book that encourages children to be empathetic to the animals caught up in WW1. Torty and the Soldier was released this week in Morrinsville and in Wellington, and is also available in Australia at these stores: ABC store, Dymocks, Rosebud Book Barn and Scholastic. See more about Fifi Colston, Jennifer Beck, Torty and the Soldier here. 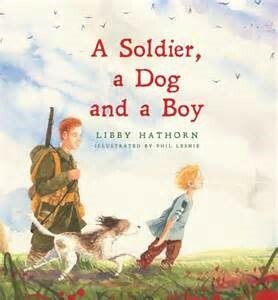 This week's feature author, Libby Hathorn, has just had her book 'A Soldier, A Dog and a Boy' long-listed for the 2017 Children's Book Council (CBCA) Picture Book of the Year Award. That means it is a Notable Book for this year and here's hoping it might even go further ... Several other authors in the exhibition have been shortlisted too, including: Pamela Rushby children's war book called 'Lizzie and Margaret Rose', Dianne Wolfer's book 'The Shark Caller', Anna Pignataro's book 'Agatha and the Dark', and Claire Saxby's book 'Wild Pa'. 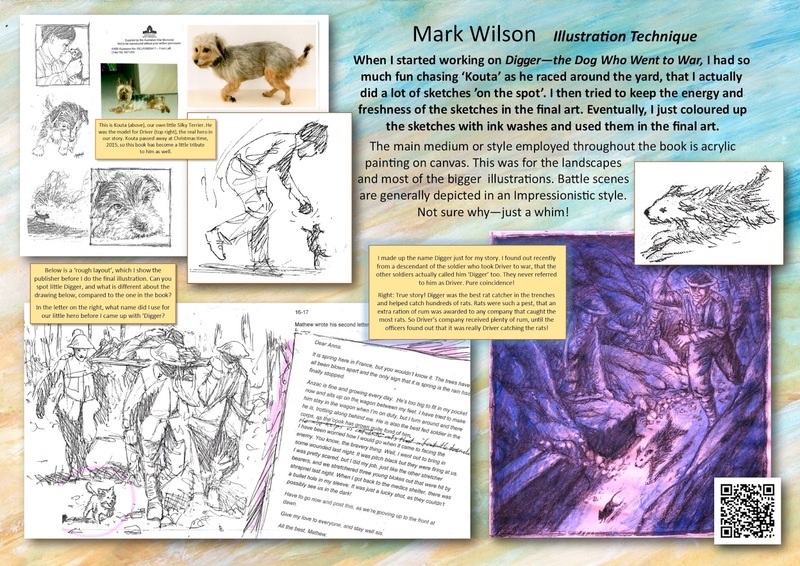 Phil Lesnie's stunning illustrations are also shortlisted in the CBCA Book of the Year Awards. Libby was inspired by a WWI photograph, from the collections of the State Library of NSW, of a returned Australian soldier opening a sack revealing a young orphaned French boy who was smuggled out of France. Her Uncles experiences in Gallipoli and the Battle of the Somme also shaped the story, as well as months of research at museums in Australia and France. 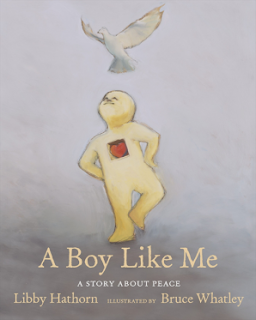 Libby has also written another children's war book called 'A Boy Like Me: A story about peace' illustrated by Bruce Whatley. Libby was inspired for this work by a poem about peace by WB Yeats and in turn Bruce, as artist, was inspired to use his left hand to get what he believes is a simpler and more emotional response to the text. See for yourself. Artwork copyright Fifi Colston. Simple theme. Powered by Blogger.